The Aubrac motif, although related to Provençal prints, has a slight mountain connotation, hence its name. The Aubrac plateau is an average mountain in the south of France. The rectangular center of the table cloth drawn with beige intertwined hearts tone on tone, gives the theme. It is framed by large borders of different patterns in color, themselves highlighted with edgings, one bright, the other graphic. The small flowers of the central frieze are very discreet and bring brightness to the piece. The Jacquard weave highlights the texture of these placemats made in Provence with the greatest care by a specialized factory. Tablecloths, rectangular or square, table mats and runners are available in the categories concerned also in the same colors. You will notice that according to the shape, the Aubrac pattern adapts and transforms into a centered floral design, rosette or bouquet, or diamond. The borders expand or wither, in order to make the decor simple and elegant. 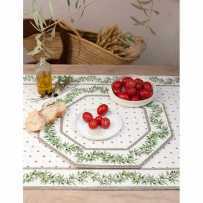 As to dining mats, they match all the products mentioned above, but also the cushion covers. For example, those can soften a chair back for more comfort. But if you set your cushions on a couch, the rectangular tablecloth 57 inches by 57 is equivalent to a sofa plaid. This dual use is very profitable for items of such quality. The color ecru and orange is very clear without being too strong, to brighten a pretty kitchen, or a small mountain chalet. If you prefer more neutral tones, the other two colors will be more adapted to your needs. 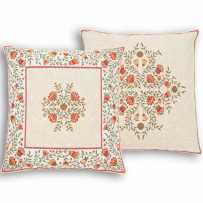 In red, your taupe placemats will be warmer, while they will bring sweetness and character in blue.